Special thanks to @oups for the logo. It uses main STEEM posts as questions (polls), replies of the STEEM posts as votes. See an example poll and it's corresponding visualization on steemit. Polls are great to learn opinions and preferences. I am sure that the STEEM users may come up with great use cases on this subject. One of the good things about storing the data in the blockchain is that the data cannot be tempered, changed, manipulated by an authority. You can always check the real data and real numbers exactly from the immutable storage on the STEEM. 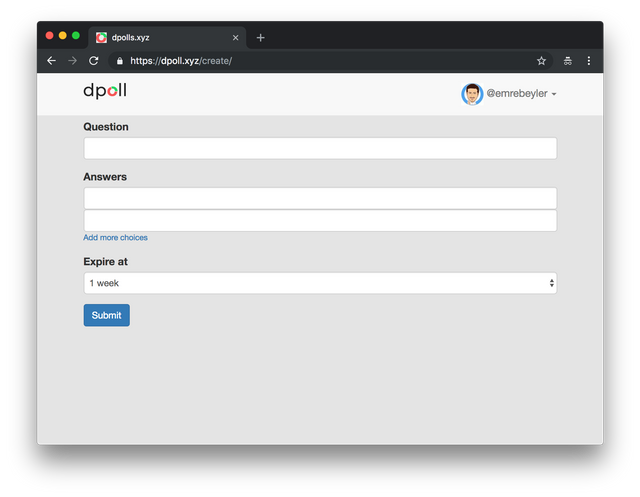 Every time a poll is created, dpoll.xyz also bundles a couple of custom JSON in the json_metadata to make the filtering on the blockchain easier. Dpoll, is a minimum viable product, at the moment. I have developed it as a one man team to join the Utopian hackathon. That being said, it's considered as an alpha product, at the moment. This is a public testing stage where the users may encounter bugs and problems. Use it at your own risk. 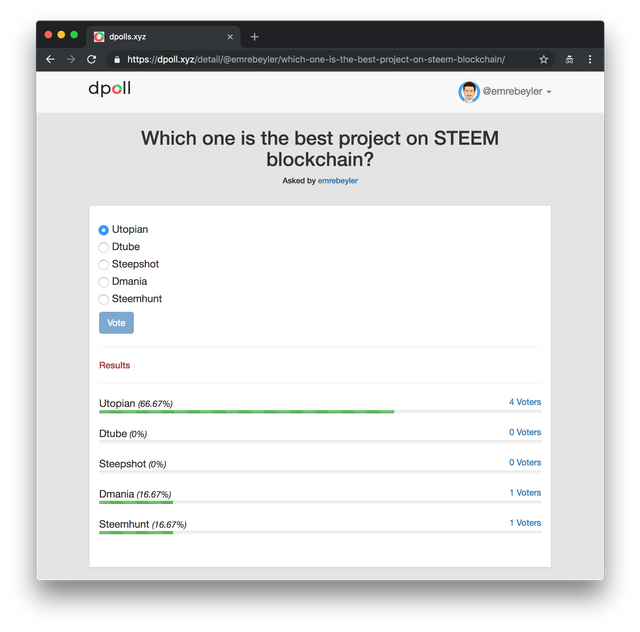 To authorize STEEM users, dpoll uses Steemconnect. It's a kind of industry standard at the moment. It never stores the keys of your accounts. Steemconnect tokens are stored as cryptographicly signed HTTP-only cookies. Adding support for private posting key logins is on the roadmap, but it's not prioritized yet. After logging in with the Steemconnect in the website, click "create poll", and you're all set. 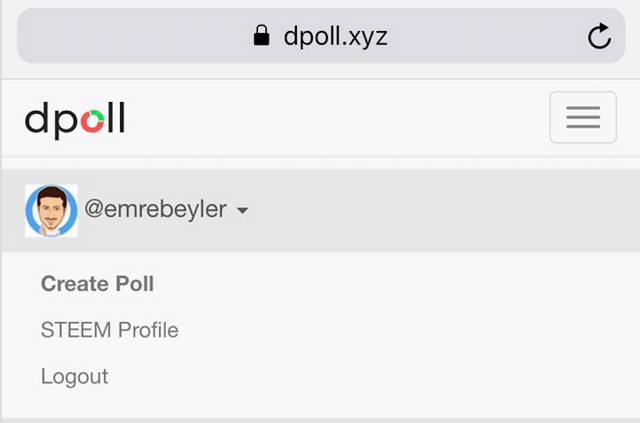 Dpoll is an open source Python/Django project lives under @emre/dpoll.xyz. Since this was initially a prototype for a hackathon, there are some ugly pieces needs to be refactored. So, feel free to work on issues and contribute to the project. Discussions on the polls to increase engagement. Option to "vote" from Steemit or other interfaces via comments. That will not require any additional authorization. I do my best to support the blockchain with my skills. If you want to support me, consider casting a vote on via Steemconnect or on steemit.com. I know you are pretty busy with the Steemworld, all the time :) dpoll is not on that level yet, but I can say it's a good start. I want to say wow you did a beautiful job on this. Did you really buy the website and code this whole thing in one day? This is a great application. It is apps like this that will drive Steemit forward and help to make it more popular. Woot woot, I say for a quick hackathon project this is indeed a deserving trending post. I'm planning on looking into Django. How is the learning curve on this? Either Django or look into Qasar with Python backend (if that's possible). An application that allows to learn all Steemians' opinion in a simple way! Its logo also looks cool! Well, I have to admit that this is an impressive development. That's a nice dapp! I tried it out, and it seems to be working great. I have wished for a poll feature on the Steem blockchain for a while, and I've seen other people want it as well, so I'm sure there's a potential for a lot of usage with this. Bir dpoll hesabına ihtiyac var o zaman, çok beyendim. Steemit hesabı ile siteye steemconnect ile giriş yapıp kullanabiliyorsunuz. I think, this has a great potential to be developed as a full fledged dapp. May be there can be one team, who would publish the polls and then people answer them and get upvoted. 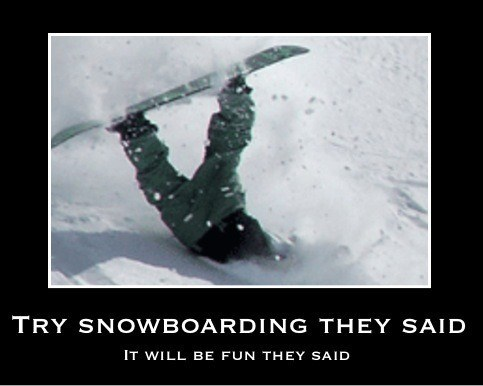 Love it... I was going to create something like this myself... but don't currently have the technical knowhow to pull it off. This looks great. Look forward for this rolling out. I woukd like to try it with my followers as I continue to engage with them and trying to understand how to improve. Wow you got something really cool going on. I'm glad you posted this. I will be using dpoll soon. Cool and usefull project and quite an impressive amount of working code in a relatively short amount of time. I thought of something that could potentially make it even more popular. Allow the creator of the poll to add a prize in SBD that will be paid to a randomly chosen voter. It is great initiative. We were feeling need for such a product on steem and now its here. All the best. And do let us know whenever you like to viral it. Nice idea. Great result in such a short time! What is steem-bounty? I have missed that. Create sharing option with embed code. Just keep those dAPPs coming to the steem blockchain. The more bright ideas coming, being implemented and maintained the more stable is our blockchain. By the way hows the prep for HF20? Oh goodness and here I was thinking just a day ago that STEEM is missing one of the more common and simple but most effective tools for audience engagement -- POLLS! Nice. But votes shoudnt be upvotes? Great idea! I would prefer an option for users to somehow vote without steemconnect. Be sure to announce when the next version comes out. Would like to experiment with it. Later, it will be possible to vote by commenting, but if you want to create polls, you need to do that step in the first time. Great one! I hope multiple choices can be made in future versions. Finally a poll on Steem! Interesting this Steemit raminification for surveys. You have my support as a witness. Successes in everything good you undertake! I really like the work you have done here. I see how this could become something popular. But there is one thing missing, you can't upvote. Maybe it would make sense to add a feature to upvote the most interesting polls and display another category on the homepage with most popular polls. This will also create a financial incentive for people to use dpoll. Congratulations! Links to your site and post were included in the Steem.center wiki page Steem Ecosystem: A - L. Thanks and good luck again! I think, I NEED a Feature, where you can set the Poll Expiration Date to ,,never". Why can't you upvote on polls?